The music of Craig Padilla falls squarely into the category of Electronic Spacemusic. His themes deal with distant places and far-out concepts meant to spark the imagination of the listener. But however high the musical concept, the execution of his albums is always a more tactile experience - the shaping of electronic sounds so that the Earthbound listener can also take part in the cerebral voyage. 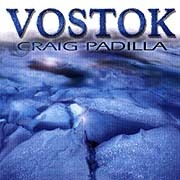 Padilla's album Vostok is an excellent combination of conceptualization, performance and transformation. At 51 minutes, Vostok is a long-form piece. The meditation begins with some classic white noise. The filter slowly sweeps us into the piece and soon low undulating drones are introduced, adding density to the windblown soundscape. The piece fills out with layers of breathy synth pads, resonant filter motion and arcs of meandering melody. From out of this dense interplay, the beginnings of a staggered, somewhat hesitant, pattern emerges. The pulse fills out and we travel along its ever evolving progression; a forward momentum towards the space that Padilla is bringing into our dreams. The cycle of smooth flowing chords and multi-layered rhythms provide the setting, but from here on it is up to the listener to make what they will out of this free musical fantasy. Vostok is an expansive piece. The music and sounds develop at their own pace, drifting in and out of focus according to each listener's disposition. With Vostok, Craig Padilla seeks to realize music that helps us find a way to a serene center in the midst of a perplexing world.